There is so much that we don't know about ancient American civilizations, and so much that we thought we knew that has been shown to be inaccurate or incomplete or just flat out wrong once more information surfaced. 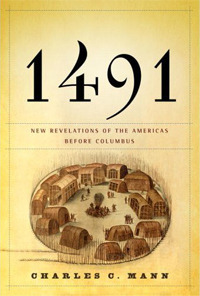 In 1491: New Revelations of the Americas before Columbus, Charles C. Mann takes us through several of these myths and deconstructs them with the latest archaeological and anthropological evidence, describing what he's doing as "re-revisionism," with tongue firmly in cheek. Much of our earlier understandings were rooted in what Mann calls "Holmberg's Mistake," or "the supposition that Native Americans lived in an eternal, unhistoried state" before their interactions with Europeans. This, Mann claims, explains "the colonists' view of most Indians as incurably vicious barbarians" as well as its "mirror image...the dreamy stereotype of the Indian as a Noble Savage." Both of these viewpoints deny Native Americans agency, assuming that "they were not actors in their own right, but passive recipient of whatever windfalls or disasters happenstance put in their way." This line of thinking draws from European prejudices and "white privilege" and is demonstrably false. For generations, European civilizations were assumed to be superior to anything in the ancient New World. Then scientists began making startling discoveries. For example, the Maya invented the concept of zero long before European civilizations, to the tune of almost 1000 years prior. They also used a sophisticated system of three interlocking calendars, based on their observations of the stars. In fact, Mann says, "the Olmec, Maya, and other Mesoamerican societies were world pioneers in mathematics and astronomy." On the other hand, the only use they found for the wheel was on children's toys. Mann suggests this could be due to a lack of beasts of burden in the Americas, as well as what he terms "wheel-blindness." Mann explains, "Although Mesopotamia had the wheel in about 4000 B.C., nearby Egypt did not use the wheel until two thousand years later, despite being in close contact." And it wasn't only ancient american civilizations that showed this kind of blindness. Another example is the moldboard plow, invented by the Chinese, in which the plowshare is shaped like a V, reducing friction and more effectively plowing the soil. "Until the Chinese-style plow was imported in the seventeenth century, farmers in France, Germany, Italy, the Netherlands, and other states labored to shove what amounted to a narrow slab of metal through the earth." Two thousand years of walking behind the inefficient models of plows and not one European came up with a better design! Did you know that Indians developed three-fifths of the crops now in cultivation around the world? Tomatoes, peppers, squashes, most of the beans, even potatoes, all came from the New World. Maize is a particularly interesting subject because it would have required intense and deliberate genetic engineering in order to become the useful crop it is. The Colombian Exchange, or the cross-pollination of the Old World with the New, yielded an "ecological explosion" as plant and animal species were introduced into completely new environments that literally changed the face of the world. Of course, Mann discusses the devastating effect of Europeans diseases on Native Americans, as well as the various estimations of how many people were killed by smallpox and other infectious diseases. He describes the results of a series of outbreaks of smallpox, typhus, influenza, diphtheria, and measles on the Inkan culture, estimating that as many as nine out of ten inhabitants of Tawantinsuyu, a major center of the Inkan empire, died over the course of a few decades. "Disease turned whole societies to ash." There is a fascinating section on genetic homogeneity among Native American populations, which may have contributed to their susceptibility to these diseases, though he is careful to explain that homogeneity does not necessarily mean genetic inferiority. One of the most intriguing legacies from ancient American cultures that Mann highlights comes as a postscript to this fascinating book. In the last section he describes the Haudenosaunee, a loose military alliance among a handful of Native tribes in what became New York. Colonists in the area frequently had close, personal experience with Indian cultures and noted how they were "characterized by a level of personal autonomy unknown in Europe," "antiauthoritarian attitudes," and an "insistence on personal liberty [which] was accompanied by an equal insistence on social equality." The insubordinate attitudes displayed by the colonists during such events as the Boston Tea Party, may well have been inspired by Native cultures. "In the most direct way, Indian liberty made indigenous villages into competitors for colonists' allegiance. Colonial societies could not become too oppressive, because their members--surrounded by examples of free life--always had the option to vote with their feet" and go live with the Indians, and many did. Mann has collected a stunning amount of information that will challenge the notions of Native American cultures you were spoon fed in elementary school, and open your mind to the rich diversity of ancient American civilizations as well as how much more we have to learn.